Originally published in 1990. Many post-World War I autobiographies focus on episodes of crisis. In a century torn by global strife and breakdown of cultural institutions, autobiography provides a way of recovering from crisis and restructuring reality–a healing act that involves the writer in a "wrestle with words and meanings" that can be deeply regenerative. Narration can be a way of purging guilt and pain, re-centering the self, and reconnecting with community after a shattering experience has driven one into silence and isolation. This book considers the problems, such as finding words for the inexplicable, the narrative perspective chosen and the traditional forms or narrative structures as means of re-patterning consciousness. It looks at seven autobiographies as crisis narratives and demonstrates how therapy and art merge in autobiography so that the literature acts back upon life. Works considered: Vera Brittain’s Testament of Youth; Elie Wiesel’s Night; Christa Wolf’s Kinheitsmuster (A Model Childhood); C. S. Lewis’ A Grief Observed; Peter Handke’s Wunschloses Unglueck (A Sorrow Beyond Dreams); Adrienne Rich’s Of Woman Born; Robert Prisig’s Zen and the Art of Motorcycle Maintenance. 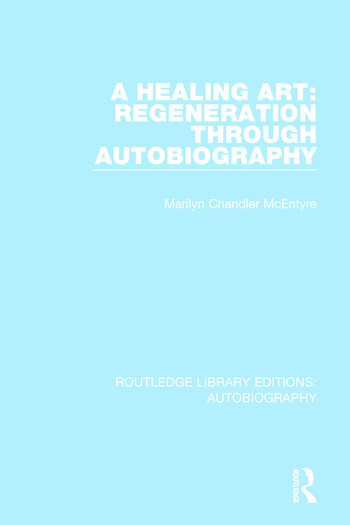 Marilyn Chandler McEntyre is Professor of medical humanities at the University of California, Berkeley - Center for Science, Technology, Medicine & Society.